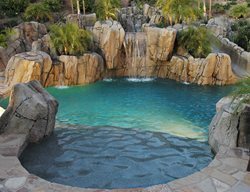 This pool project in Yorba Linda, CA. 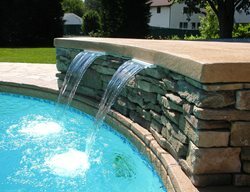 features 30% precast concrete and 70% hand sculpted concrete to create this realistic water feature. 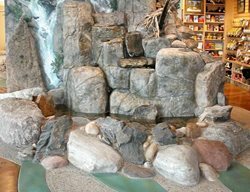 A 30 foot slide was incorporated into the rock feature. 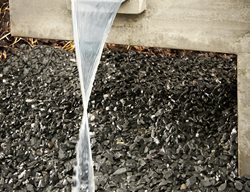 R-Crete semi transparent stone stains and seals were use to give the rocks their color. 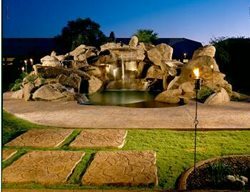 Winner of a 2012 ASCC Decorative Concrete Council Award - First Place Certificate for Overlays/Spray Textures. Winner of a 2012 ASCC Decorative Concrete Council Award - First Place Certificate for Graphics. The location of this project was once the site of a housing project that was in such bad shape following Hurricane Katrina that it was torn down completely. Part of the new construction was a pool and splash park. The spalsh park is 735 sq. ft. and honors the city's love of music with its design. 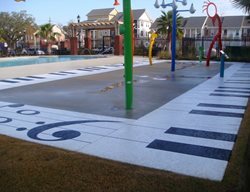 Piano keys and musical notes were incorporated into the Sundek classic spray texture system. 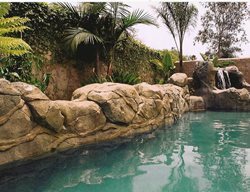 This project was designed as a themed outdoor environment that blended the home's suburban architecture with a fun waterpark type pool. 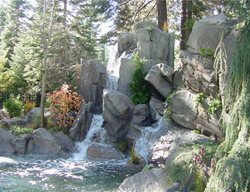 The pool features a rocky mountainous structure with a 40' carved concrete slide, waterfall and a water cannon. The entire structure was made from cast-in place concrete & block, veneered with cast & hand carved rocks. Once the rockwork was completed, the entire structure was colored with multiple colored concrete stains for an antiqued look. 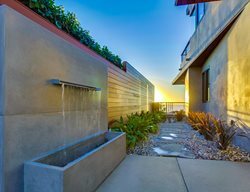 Housed under the concrete stairs leading up to the slide is a pool bath and outdoor shower. 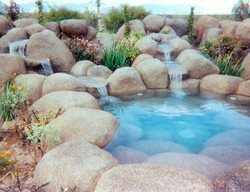 A rock lined spa is tucked away in a small alcove created by the curving slide. 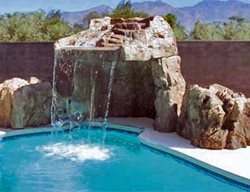 A creative mixture of materials was used to give the pool a hybrid feel; antique brick and stucco is used to tie the traditional paver brick sunning area into the house while stamped concrete decks and rockwork are featured in the rugged side of the pool area. 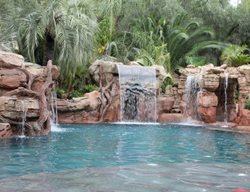 The pool has a Pebble Tec finish that gives it it's beautiful green lagoon appearance. Rough sawn cypress arbors, lattice and fencing are imbedded in the beautiful landscaping that harmoniously blend all of these materials together. This backyard water feature incorporates decorative concrete in the shape of Skull Rock, the iconic rock feature in Disneyland’s 1953 classic "Peter Pan". Fitted with LED lights, the skull casts a red glow at night. 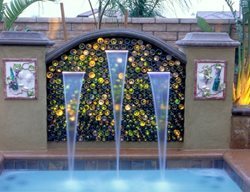 This backyard oasis also includes an outdoor kitchen with swim-up bar. This cave has five areas where folks can relax and watch the waterfall from the inside. On top is a 45 foot long slide and a large planter. This cave is surrounded by a 504ft long tubing river with large waterfalls at the start. 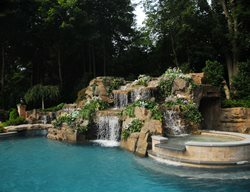 High end residential swimming pool with waterslide, and spa room inside grotto. 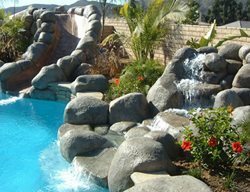 The homeowners did not like the existing waterfall in their backyard pool and wanted to remodel it. See the "before" image below. This pre-existing concrete swimming pool in the backyard of a home in Yorba Linda, California, was the basic red brick and white plaster. 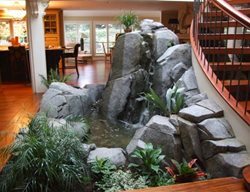 Matrix Concrete Artisans used 15% precast rock for the focal points and hand-sculpted the rest to create this stunning water feature. Swiss Family Robinson themed pool combines a variety of fun features such as a faux wood boat, a palapa with fire pit, an outdoor kitchen with hand-seeded seashell countertop, a pool slide with cave, a garden bridge that crosses a sandy beach which also serves as a sand trap for a putting green, and more. Read more about how this project was designed and built.